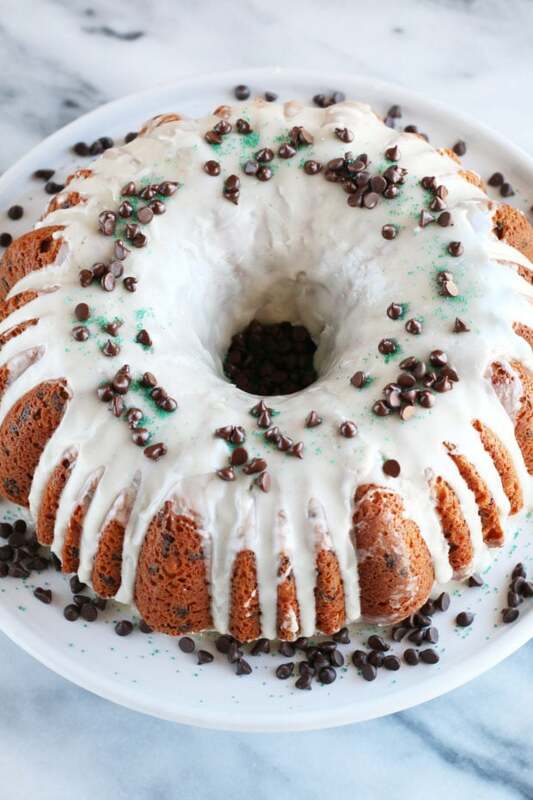 Bailey’s Chocolate Chip Bundt Cake is the perfect sweet ending for any of your St. Patrick’s Day celebrations this year! 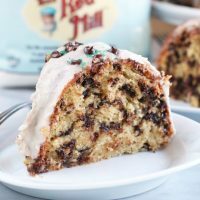 It’s an easy, gluten-free cake that’s still moist and fluffy, while also being rich in Bailey’s Irish Cream flavor. You’re going to feel like you snagged the pot of gold at the end of the rainbow with this one! Disclosure: This post was sponsored by Bob’s Red Mill. As always, all opinions and recipe are my own. Thanks for supporting the brands that support Cake ‘n Knife! Who’s excited to get into the Irish spirit this weekend? THIS GIRL. For me, getting into the spirit tends to include something special..
To me, Bailey’s Irish Cream is the quintessential liquor to bring out on St. Patrick’s Day. I think it’s because my grandma used to looooooooooove the stuff and every time I think about my Irish heritage, I find myself thinking about her. Whether it was being poured over her ice cream or she was using it to top off her after dinner coffee, I always loved to see that sneaky smile on her face as she indulged. People who love food are the best people – isn’t that what Julia Child said? She used to pour it into coffee or over ice cream, but I’m taking the tradition of adding Bailey’s to recipes to a whole new level… with CAKE. Personally, I am not one to subscribe to the “I have to make everything GREEN!” for St. Patrick’s Day celebrations. Instead, I want to keep the flavors of my heritage, but Lord knows I don’t need any of that green food coloring in my life. As much as I love having my tongue turn green, I’d really rather skip that look this year. 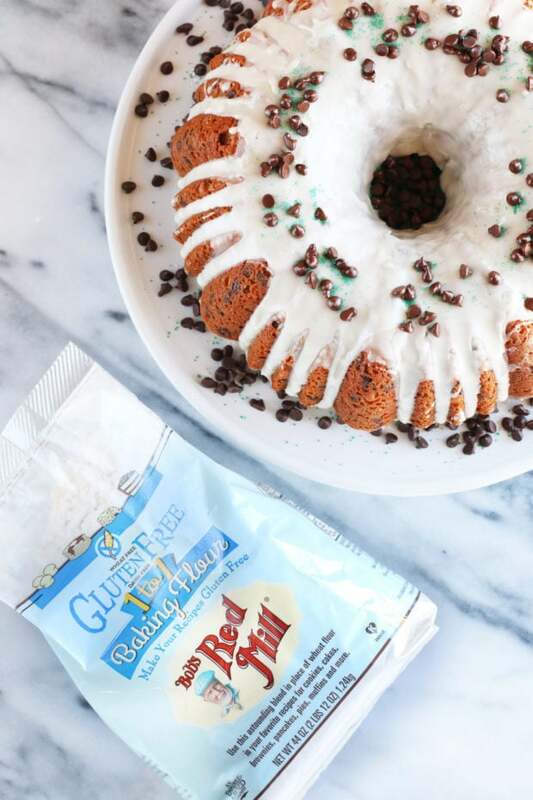 The magic of this cake is the texture and flavor which, you are going to find hard to believe, is 100% gluten free! 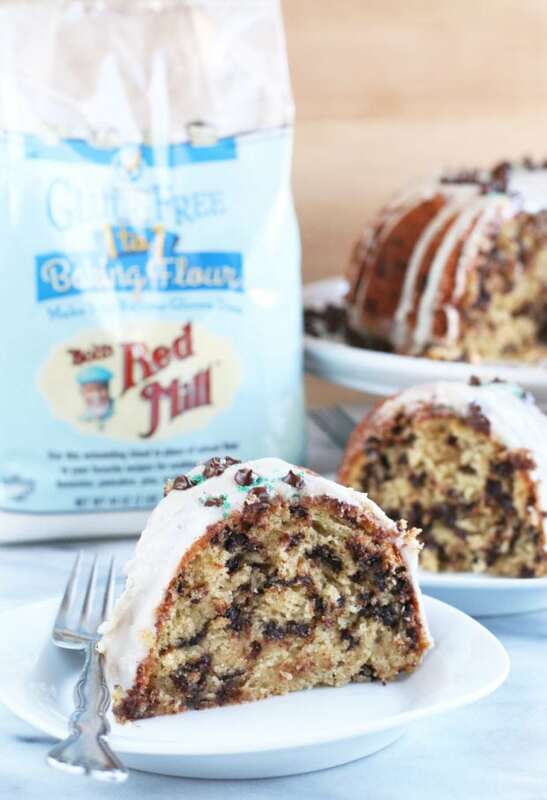 Have you ever tried Bob’s Red Mill’s Gluten Free 1-to-1 Baking Flour?? 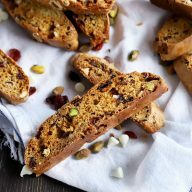 Say goodbye to trying to convert the recipes you want to make gluten free so they work with various different flours and meal. Now every recipe can be gluten free with this easy peasy 1-to-1 flour! Simply use the same amount of this flour as AP flour for any baking recipe and boom, just like that you have a gluten free masterpiece without any of the heavy lifting you may be used to. 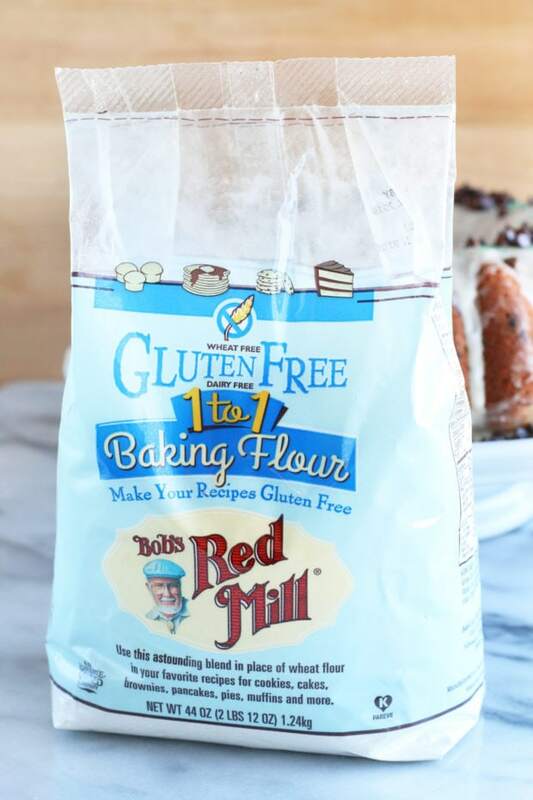 I also love this flour, because all of you who may not be gluten free can simply use Bob’s Red Mill Organic All Purpose Flour in lieu of the gluten free flour. It’s totally a win-win, no matter what your gluten needs may be! 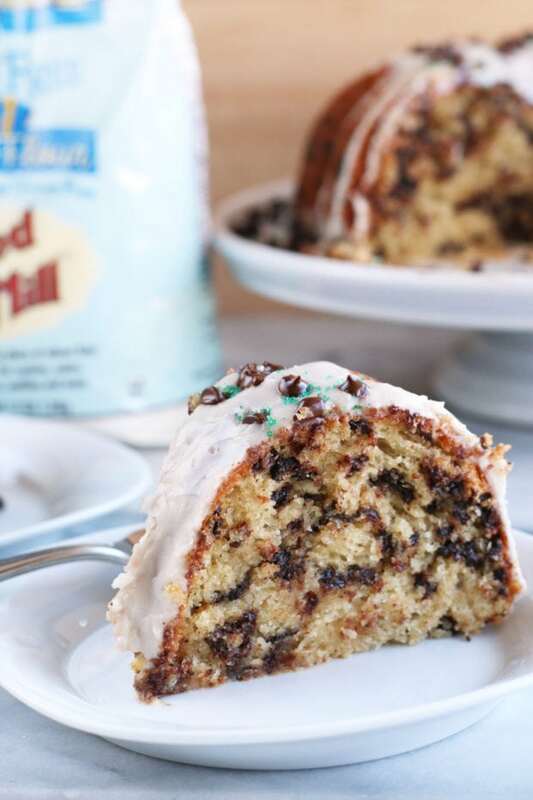 The cake itself is moist (yes, I still hate that word, but I have yet to find a better one…) and fluffy, while being packed with Bailey’s Irish Cream flavor and chocolate-y goodness! It’s just the right amount of sweetness with a hint of boozy and a vanilla bean glaze to top it all off with. A slice for breakfast, a slice for lunch and a slice for dessert – eat it anytime of day for the best sweet treat! Want to see just how simple it is? Check out my video below! is very similar to the one I used for this cake (I just can’t find the original product because it’s not there anymore!). = my favorite spatula/spoon utensil! KitchenAid 7-Quart Pro Line Stand Mixer for the perfectly mixed cake. 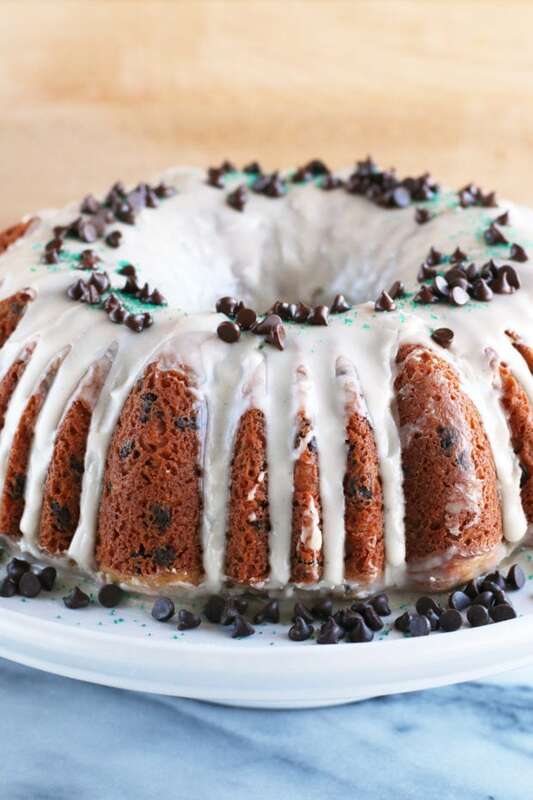 Pin this Bailey’s Chocolate Chip Bundt Cake recipe for later! Moist and light, this Bailey's-infused cake is a stellar sweet treat everyone will love, PLUS it's gluten-free (or can be made with AP flour in the exact same measurements you see in the recipe!). In the bowl of a stand mixer, combine butter and sugars. Beat on medium speed until well combined and fluffy, approximately 2 minutes. Add eggs and vanilla, beating to combine. Add half of the flour, baking powder and salt to the stand mixing bowl. Beat until combined. Add Greek yogurt and Bailey's Irish Cream, beating until combined. Add the remaining flour and baking soda. Beat on low until just combined. 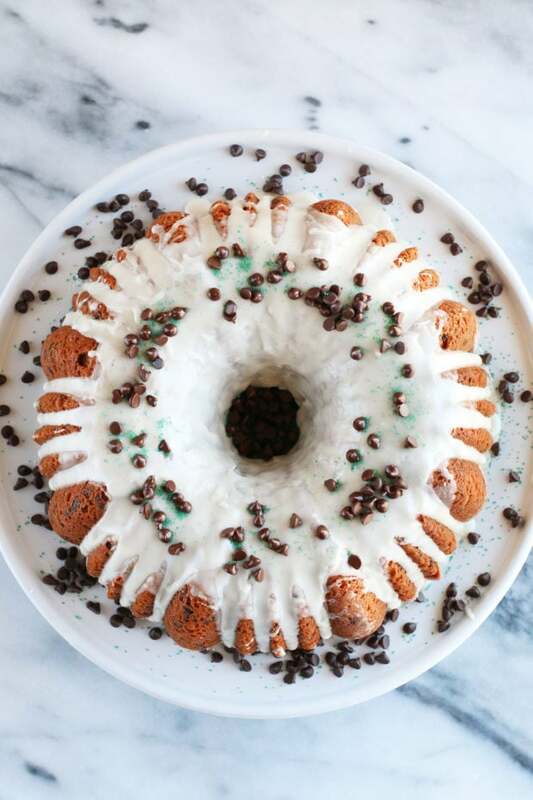 Grease a 10-cup bundt pan with cooking spray. Spoon the batter evenly into the pan and smooth the top. Bake for 30 to 35 minutes, until the top is set and golden. Set aside to cool 20 minutes. Invert on serving platter until completely cool. When the cake is cool, whisk together ingredients for the vanilla bean glaze. Pour the glaze over the cake as desired. Serve immediately. 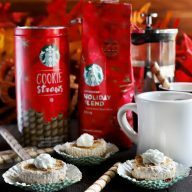 Decorate with more mini chocolate chips and green sprinkles as desired. Note: You can use AP flour in lieu of Bob's Red Mill Gluten-Free 1-to-1 flour in the same measurement listed in the recipe, if desired. Make sure you use gluten-free chocolate chips. Not all chocolate chips or chocolate is gluten-free. Very good call! I forgot to add that note to the recipe so I will do that now! The recipe sounds delicious but is I don’t know that Bailey’s Irish Cream is gluten free? Thank you so much! 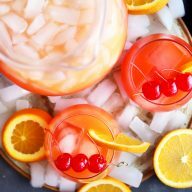 After doing research, I found that on the whole most say that Bailey’s is gluten-free because it is made from distilled liquor. It is hard to judge since Bailey’s keeps their official ingredients under wraps, but I have found that many say that it is ok for gluten-free diets.